Handling of requirement for sourcing is one of crucial activity in procurement area where identify the new Source of supply or assign existing contract to get maximum benefit on pricing. There are multiple ways to handle Procurement of External Requirements in SAP SRM. In traditional way Purchase Requisition created in backend system transferred using standard report where as in new technology it’s SOA based communication. 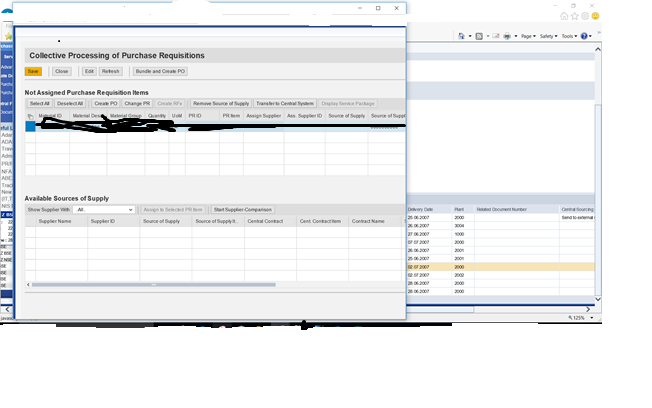 Handling material as “Local Material” where leading Purchase Order created in SRM and than replicated to ECC system using extended classic scenario .This can be achieved in “Classic Deployment Scenario” as well. Maintain tables V_160PR & V_160EX to handle custom logic and configuration. Use of BADI BBP_BADI_EXTREQ_OUT OR user exit BBPK001 in ECC to handle custom logic for transfer requirement transfer. This BADI called before BBP_EXTREQ_TRANSFER .We can override the entire standard transfer as well as influence the grouping of requirements. Table EPRTRANS used for updating transferred documents. PI Involvement not required here . After successful transfer of PRs and based on configuration in SRM system these external requirements will be available in SRM Sourcing cockpit as Shopping cart (SC) for further processing. 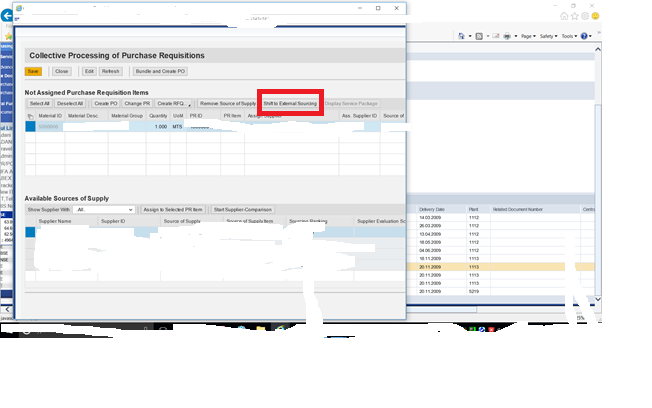 From EHP4/ERP 6.0 requirements can be transferred using Collective Processing of Purchase Requisition (CPPR) .In both ways we can handle custom checks like Purchase Group/Material Group validations. As per Collective Processing of Purchase Requisition handling of Direct Material possible in SRM .Here creation of Purchase Order done in SRM system where deployment scenario is “Extended Classic” . Using BADI ME_REQ_SOURCING_CUST we can handle custom logic for additional validation .Parameters available on PR documents for Plants\Purchasing Group etc validations . PI is mandatory component to process XML messages for CPPR. To handle CPPR for “Direct Material” procurement using “Classic Deployment” we need to implement BBP_DETERMINE_LOGSYS BADI .This is P2P(Procure-to-Pay) cycle where purchase order created back to ECC system from existing source of supply. Additionally SC created with Document type “EXTR” where we are handling Materials as “Externally Procured” backend materials. Here EXTR document created by RFC user. RFC user in organization structure of SRM should have valid plants and company code attributes assigned .Processing user should have harmonized purchaser portal roles. Missing attributes for Plant or Company code to RFC user will not allow PO creation for desired plant or company code. I have done the required settings for CPPR , my scenario is classic with one SRM and 2 backend , one backend is already up & running for backend number 2 we are configuring all the settings .